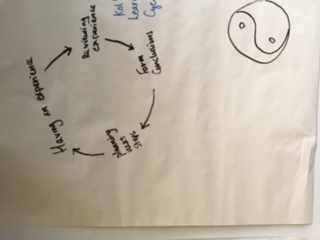 The following is a reflection on the week immediately after the class that took place on Tuesday 25th October 2016 using Gibbs Reflective Cycle. I set up a group on WhatsApp for The Compostivists and invited Allesio Gemma, Michael McKeever and Rachel Maguire to join the group. I think that it is important to use instant messaging if we want our group to be efficient and effective in its work over the coming weeks. On Saturday 29th October 2016, our group had its first meeting (F2F) in the Westbury Hotel, Dublin 2. The Compostivists: Allesio Gemma, Gerard Kilkenny, Mick McKeever, Rachel Maguire. Allesio will email the group with a photo of the group taken at this meeting using Allesio’s camera phone. Communication methods will include email, Whats App, face to face meetings. Mick McKeever will ask Dolores McManus to set up a virtual class for the group in DIT’s Blackboad LMS so that the group can use file sharing, chat, etc. All members of the group will also have an instructional design role. Articulate Storyline will be used for storyboarding and Adobe Captivate will be used for authoring. The next group meeting will be in DIT, Kevin Street at 11 am on Saturday 12th November 2016. This was a good first meeting for our group. 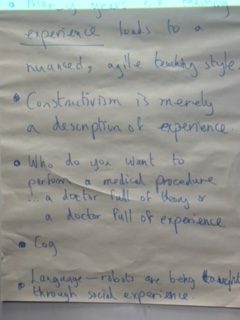 We decided how the group’s work would be shared out and what roles individuals within the group would have. It is good that we now have a list of areas to be considered for the composting lesson. 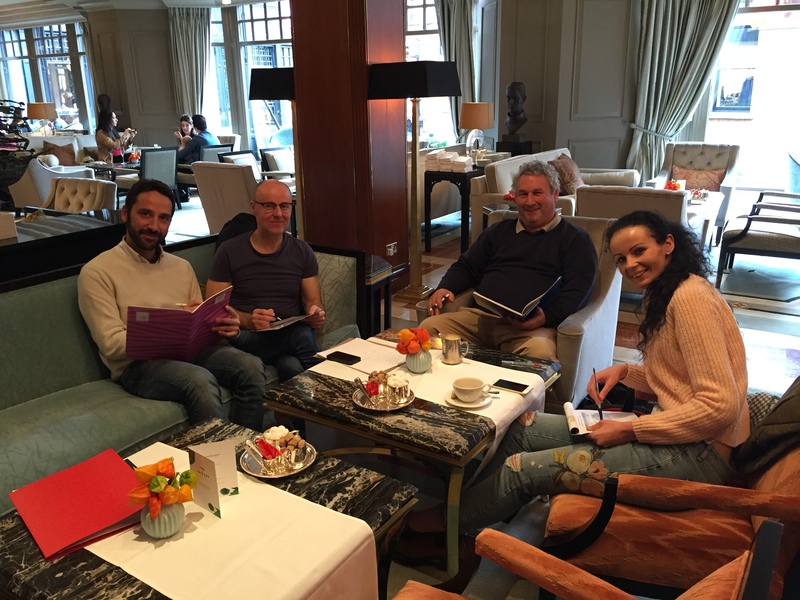 The group decided to wait for two weeks to meet again as it will take at least that amount of time for Allesio and Rachel to create the first iteration of the storyboard. Now that I have located user guides and video tutorials for Adobe Captivate 9, begin the process of learning to use the different features of this tool. Read the following book chapter with a view to writing an annotated bibliography of it. This chapter will also inform the development of the eLearning resource using Adobe Captivate 9. Clark, R. C., & Mayer, R. E. (2011) Applying the Contiguity Principle. In Clark, R. C., & Mayer, R. E., E-learning and the science of instruction: Proven guidelines for consumers and designers of multimedia learning. San Francisco, CA: Pfeiffer. The following is a reflection on the Tuesday morning class that took place on 25th October 2016 from 10:00 to 13:00 using Gibbs Reflective Cycle. Later in the class, we were divided into three groups. My group consists of four students as follows: Allessio Gemma, Michael McKeever, Rachel Maguire and myself (Gerard Kilkenny). We decided that the eLearning resource we will develop will be based on composting. We decided to adopt the name The Compostivists for our group. It wasn’t too dramatic a change to move to a computer room (Room 2069) on the second floor of DIT Aungier Street. 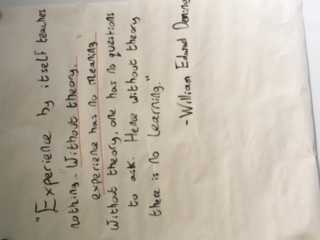 For the first five weeks of the course (the Learning Theories module), the MSc and MA students were together in the LTTC Teaching Rooms on the fifth floor. Now that the MSc and MA groups are separated for Module 2, it has now become apparent that there are 11 students following the MSc Applied eLearning degree course. My group The Compostivists have already schedule its first meeting for this Saturday 29th October 2016 in the Westbury Hotel, Dublin 2. I volunteered to carry out the development work for the eLearning resource (using Adobe Captivate) and Allesio signalled an interest in taking the lead on creating a storyboard for the resource. I have a feeling that our group will work well together. Clark, R. C., & Mayer, R. E. (2011). E-learning and the science of instruction: Proven guidelines for consumers and designers of multimedia learning. San Francisco, CA: Pfeiffer. I began reading this book about a year ago before I applied for the MSc Applied eLearning course. Damian showed the class how useful the Cite button in Google Scholar can be. I hadn’t used Google Scholar before now but I hope to make good use of it in the weeks ahead. My initial analysis was that the assessment for Module 2 (Instructional Design) is much more demanding than for Module 1 (Learning Theories). 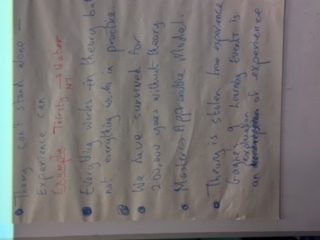 Module 2 has four assessment tasks compared to one assessment task for Module 1. Moreover, Module 2 takes place over eight weeks with 10 ECTS to be gained whereas Module 1 took place over five weeks and had only 5 ECTS attached to it. 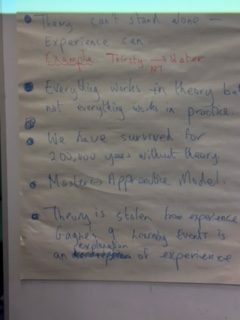 However, on closer analysis the four assessment items appear to be very integrated. The storyboard precedes the development of the eLearning resource and the annotated bibliographies inform both of these items. 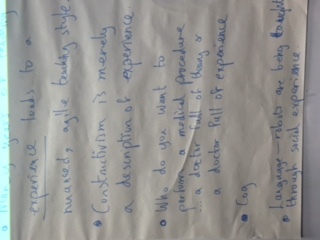 The 1000 word reflection is a meta-reflection of all of the individual reflections and this is something to be carried out at the end of the module. I think that I am going to very much enjoy this module as I am very interested in, and have prior experience of, developing eLearning resources. It will be important to carefully schedule the work required for this module in order to meet the deadlines for the assessment tasks. In relation to the annotated bibliographies (5 to 7 to be done), Damian advised us to properly critique our annotations and to say if they were useful for our group project. There should be three parts to each annotation: summary, critique, evaluation. Source some of the eleven books on the Essential Reading list. The purpose of this paper is to examine how the van Hiele model can be used as a framework in the teaching and learning of geometry to Junior Cycle Maths students. It goes on to explore how elements of the classical learning theories of cognitivism and constructivism are embedded in the van Hiele theory. In particular, it provides a comparative analysis of the Van Hiele model wih the theoretical learning frameworks of Gagne, Piaget, Bruner and Vygotsky. The concluding section discusses possible implications of the Van Hiele model for eLearning design. Level 1 (Visualisation), Level 2 (Analysis) Level 3 (Abstraction), Level 4 (Deduction), Level 5 (Rigour). Property 1 (Fixed Sequence), Property 2 (Adjacency), Property 3 (Distinction), Property 4 (Separation). Gagné et al (1992, p.44) list “verbal information” as one of the “five kinds of learned capabilities” (R-40, p.44) and this can perhaps be mapped to van Hiele’s Level 0 where “the student can learn names of figures…” (Usiskin, 1982, p.4). Similarly, the capability of identifying the diagonal of a rectangle is provided as an example of the capability “intellectual skill” by Gagné et al (1992, p.44) (R-40, p.44) which appears to have it’s equivalent in van Hiele’s Level 1 where students can understand that “rectangles have four right angles” (Hoffer, 1979, 1981) or that a rectangle “has two equal diagonals” (The Project Maths Development Team, 2014, p.32). Book (Principles of Instructional Design), Book (Michael Allen’s Guide to e-Learning) Software (GeoGebra). Curran, S. (2014). Is The Van Hiele Model Useful in Determining How Children Learn Geometry? Munich: GRIN. Gagné, R. M., Briggs, L. J., & Wager, W. W. (1992). Principles of Instructional Design. Fort Worth: Harcourt. Piaget, J. (1953). The Origin of Intelligence in the Child. London: Routledge and Kegan Paul. Yazdani, M. A. (2008). The Gagne – van Hieles Connection: A Comparative Analysis of Two Theoretical Learning Frameworks. Journal of Mathematical Sciences & Mathematics Education, 3(1), 58-63. 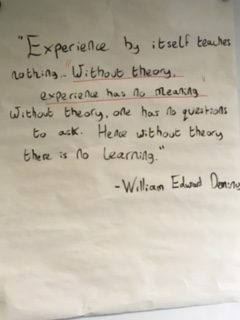 The motion was a quotation from William Edwards Deming who was an American engineer, statistician, professor, author, lecturer, and management consultant. My group opposed the motion and I had the job of writing up points 1 to 9 as well as debating against the nominee from the group supporting the motion. My group won the debate! 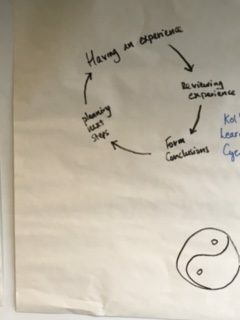 We also looked at Kolb’s Learning Cycle in today’s class.